Yesterday, I met up with my parents for a little Father's Day weekend hangout. I made this watercolor before I knew that my mom was plotting something and had planned to post it here for Sunday. I still am, but this time I got to deliver the painting too. It doesn't take much to make my dad happy. One of the things he really enjoys is a good, simple meal that hasn't been fussed with. (He's never been much for "arranged" food.) Bonus points for a restaurant that always knows exactly when it's time for a coffee refill. Dino's is exactly that. 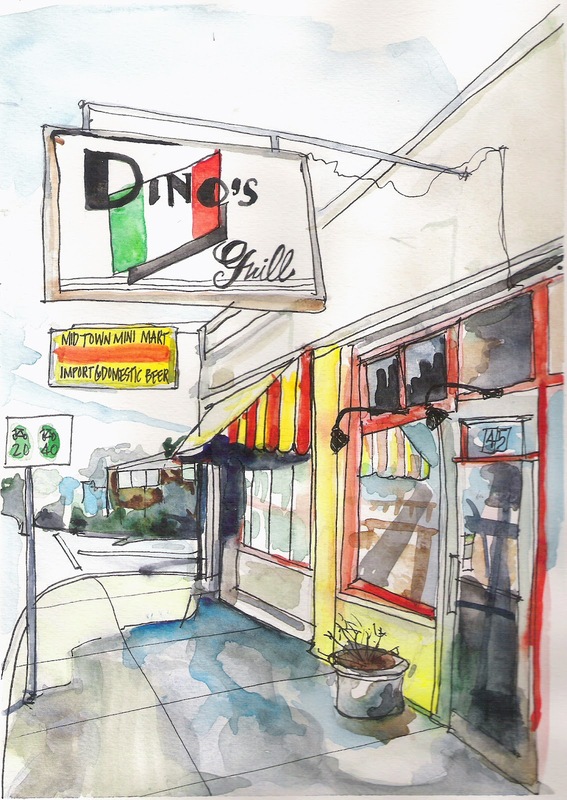 My Dad's relationship with Dino's is older than his marriage. I believe he ate there the morning of the wedding. He's been going so long that he doesn't even have to order anymore. The food just appears. And he likes it that way. So, on this special Sunday, I hope you had a fabulous breakfast of scrambled eggs, grits, biscuits, and maybe some of Mom's bacon. And plenty of coffee.